HÀ NAM — African swine fever has wreaked havoc in northern Hà Nam Province with all six cities and districts reportedly having detected the outbreak. The provincial Animal Husbandry and Veterinary Sub-department reported that the virus has spread across most of the province. 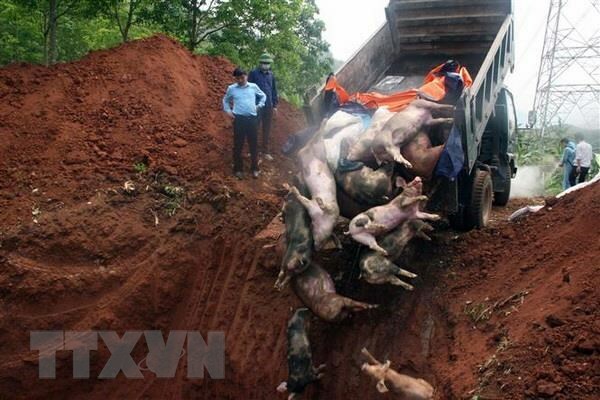 By April 14, outbreaks were reported from four communes in the province, with nearly 540 pigs being slaughtered. Two days later, two new hotbeds were discovered in Bình Lục District’s An Lão Commune and the city of Phủ Lý’s Lam Hạ Ward. As many as 133 pigs were culled. By April 16, two months after the virus was first detected, 5,300 pigs from 390 households in all of the province’s cities and districts have been culled to stop its spread. Localities in affected areas used more than 6,300 litres of chemicals and 140,000 kilogrammes of powdered lime to disinfect farms and surrounding areas. They were asked to zone off affected areas to prevent the spread of the virus. On April 9, the northern Hoà Bình Province was declared free from African swine fever. It was the first locality to announce the end of the epidemic among 23 infected cities and provinces nationwide. On April 12, the northern mountainous province of Bắc Kạn was named the second to be free from the virus. The epidemic was first recorded in Việt Nam in mid-February and quickly spread to 23 cities and provinces. More than 73,000 infected pigs have been culled nationwide.